Ghassan Salame, U.N. special envoy for Libya and head of the U.N. Support Mission in Libya (UNSMIL), delivers a speech at the mission headquarters in the capital Tripoli, March 20, 2019. “If the opportunity presented by the National Conference is not seized, then we will be faced with only two options: prolonged stalemate or conflict,” special envoy Ghassan Salame told the Security Council by videoconference from Tripoli Wednesday. 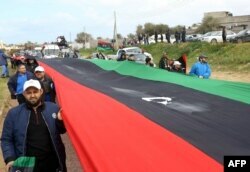 Libyans carry a giant national flag in the capital Tripoli during a celebration to mark the the upcoming eighth anniversary of the Libyan revolution that toppled Moammar Gadhafi, Feb. 25, 2019. A Western-backed administration in Tripoli and a rival pro-military government in the east are jockeying for power and control of the country’s oil wealth, along with a number of armed militias.